I want to start by giving credit to The Book Chubi for revewing and recommending this book. I had heard of it early in the year but after reading this review http://thebookchubi.blogspot.com/2009/12/yet-do-i-fear-thy-nature-it-is-too-full.html I had to try it, and what a book it is! 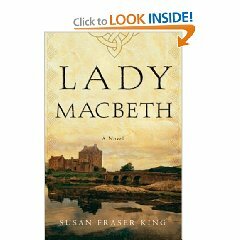 How does one start a review of a book as well written and engaging as Lady Macbeth by Susan Fraser King? Should I start by telling the story of my high school senior English teacher who acted out the Shakespeare play Macbeth, thus starting my long obsession with the queen who desperately tries to wash blood from her hands or should I start by saying I am usually disappointed by historical fiction? How about a little of both. During my senior year we were blessed with an English teacher who secretly wanted to act. When it came time to read Shakespeare Mr. Fraser (no relation to the author) taught us how to enjoy the bard’s prose by getting on his desk as he acted out the play. Watching Mr. Fraser act out a one man sword fight is a cherished memory I hope to always keep. Lady Macbeth’s anguish over the death of King Duncan followed me through my life. I vowed I would never do something that would cause lifelong regret or sorrow. Many times in my 20s I would stop myself from doing something stupid by asking if this action would cause me to constantly want to wash it from my soul. Lady Macbeth kept me from causing myself mental scars. I never gave the person Lady Macbeth much thought, it was what she represented that stood out for me. To be honest I did not know she was a real person, I thought she and Macbeth were fictional characters or at least composites made up by Shakespeare. As I started to seriously study Irish and English medieval history I wanted to complement my studies with historical fiction. As a lifelong reader I assumed I would fall in love with this genre, but sadly I am a critic of it. Oh I have my favorites; Peter Ellis’s Brother Cadfael, and Bernard Knight’s John Crowner, but more often than not I find issue with authors who are either so busy adding description the plot is ignored or the author feels no need to describe the times in which the book is set. King weaves a tight tapestry of both plot and character. King researched both Scotland and the Macbeths; her book shows just how well she accomplished this. Lady Macbeth is the story of the last Celtic King and Queen of the Scots and the story of 11th century Scotland itself. Macbeth’s story is told as history, not as a tragedy; though I became so engrossed in their lives that the tragedy came because I knew there was only one ending to their story. The death of Macbeth was as upsetting to me as it was to Lady Macbeth as she talked of his last heroic effort to save Scotland from English rule. Other reviewers have mentioned how the voice of the Scottish queen burns off the page, yet it bares repeating. King has written a character so life like, it is as if she and King spent many long hours together. If you appreciate strong female characters who are noble in the face of adversary and are strong when necessary then you will really appreciate this book. When Macbeth kills Gruadh’s husband and takes her as his wife the book could have turned into the typical story of a man and women who dislike each other but somehow come to adore each other. King manages to write their story as it probably did happen, not how modern readers come to expect. As Gruadha rages over what has happened those around her accept it as a matter of fact. The people around her accept that Gruadha’s husband was an inept lord and that Macbeth was the better choice. Gruadha accepts her fate and the fate of her people because this was the norm. She and Macbeth slowly trust and respect each other. Though the reader is never privy to their private life, you do get the sense that these two people do love each other. As the end of the book nears it becomes harder and hard for Lady Macbeth to finish the tale as it means reliving the death of her husband. Forget what you learned about Macbeth from Shakespeare; read this book for the characters and human drama. Read the book because it is one of those rare books that remind us readers why we spend so much time curled around our couches. I have to warn you, once finish this book finding your next good read will be a challenge. If you dear readers have a favorite historical fiction, let me know. I am always on the lookout for a good book. This sounds compelling.I have a mixed response to historical fiction, I find I am enjoying historical crime, authors like Paul Doherty. I also have enjoyed Brother Cadfael. I have not heard of Doherty, I will look him up.Brother Cadfael was so much fun to read. I read the whole series back in the late 90s. Not sure why but none of Ellis' other books grabbed my attention the way this lowly monk did. Great review! I also saw Book Chubi's review, and thought this book sounded intriguing, but thought I'd have to remember my MacBeth to get anything out of it. I hate when I don't get the "references", ya know? Sounds like it's a good read anyway, though! Favorite historical fiction: The Shaara's Civil War Trilogy, Herman Wouk's Winds of War and War and Remembrance, and also The Hope and the Glory…and for pure brain candy, The Pillars of the Earth. Great Review Sari. Im not sure that this is what you are looking for but I read a book a few years ago that blew me away. An Inconvenient Wife by Megan Chance. It's historical fiction but not based on a real person or anything. I think it's a bit controversial with it's topic and I found it very interestng and well written. Sari,Your review is so well written. Have I mentioned lately how amazed and proud of you I am?I will be adding this book to my wish list now, I appreciate the review.I highly HIGHLY recommend Morgan Llywellyn's books. Druids is probably my favorite so far. Grania is very good as well. Susan,Thank you. I do not normally read romance books and since I just broke up with my boyfriend, I am not sure now is the time to start..then again maybe this is the perfect time to start. Did you write the Sword Maiden trilogy by any chance? I just saw them on Paperback Swap.I will be sure to look up your new book when it comes out as I love Scottish and Irish history.